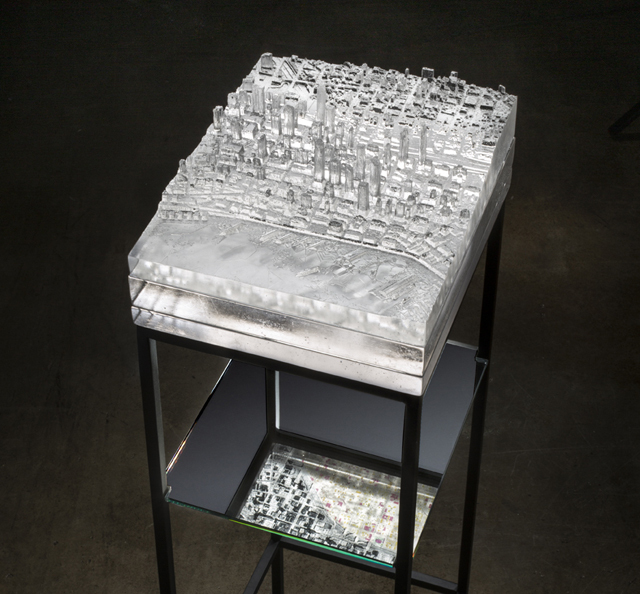 Mining Industries: Downtown Seattle, 3D printed pattern, kilncast glass, fabricated steel, and vinyl cut drawings, 38” x 14.5” x 17.25”, 2014. For the past four years I have focused on three related bodies of work that deal with landscape after industry moves on. These projects are complementary as each tells a story of population shift and its relationship to industry. 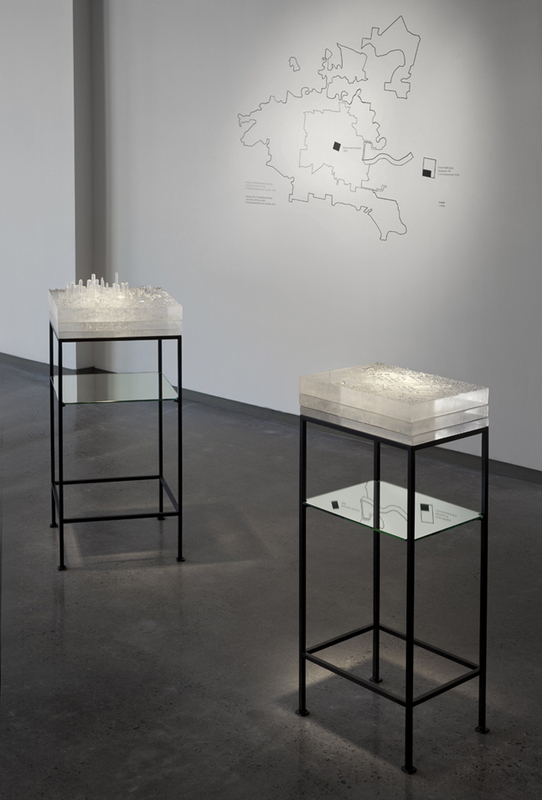 The first project, Cities: Departure and Deviation, culminated in an installation of blown glass forms and vinyl cut drawings that serve as three-dimensional population graphs of major urban centers. The second body of work is the result of a collaborative Arts/Industry Residency at Kohler Co. that explored the dynamic historical relationship between the Kohler factory and neighboring village. 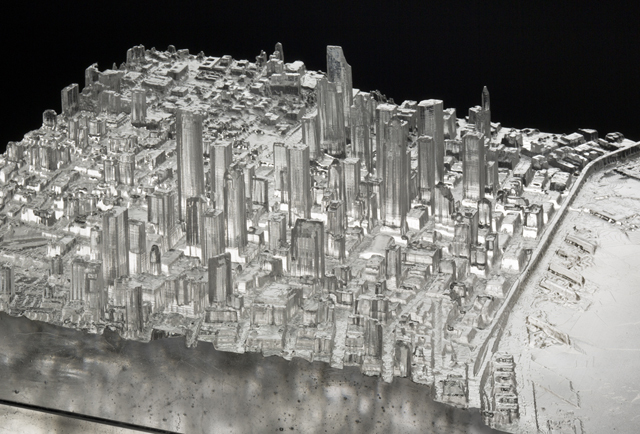 My current project, Mining Industries, is comprised of kilncast glass works created from LiDar scan data of the earth and 3D printed patterns showing aerial views of sites related to Detroit, Houston, and Seattle and their iconic industries. Mining Industries uses LiDar data captured with a laser beam during airplane flyovers that define the landscape through a coordinate system. I am interested in how the technology of Sanborn Maps, aerial photographs, and LiDar data merge to reference times of peak industrial power. I then layer these maps and photographs between stacks of clear kilncast glass blocks so that the imagery filters through the polished glass landscape from above and is seen through the layers in the mirrored reflection below. The three research projects represent my interest in the dynamic relationship between American industry and the towns that grew up around it. This focus – the domestic landscape – is a direct result of my experience growing up in the city of Detroit, which was devastated by changes in the auto industry, and moving to a small Michigan town that lost its primary employer in 2000 and was registered as a superfund site that same decade. My approach considers the tension between historical modes of manufacturing and contemporary notions of efficiency and industry’s influence on the individual and collective narratives in the surrounding communities. To create my work, I routinely consult with specialists in several areas including architecture, urban planning, industrial design, GIS data collection, engineering, and 3D printing. In many ways these conversations help to shape my creative work and the classes I teach at Grand Valley State University. In my studio practice, newer 3D computer technology is an essential tool in my creative process. At Grand Valley State University, I have access to a 3D printing lab, mold making space, and kilns for casting glass. To gather the GIS data, I work directly with municipalities and libraries that routinely hold databases of LiDar scan data, Sanborn Maps, and historical aerial photographs. For me this is strongly related to question # 3. Early on in my career, I couldn’t imagine incorporating newer technology as a regular part of my studio practice. Additionally, I enjoy the engagement with specialists outside of the field. The conversations with outside specialists are increasingly productive often resulting in future projects and collaborations. Because of regular deadlines, I try to work in the studio as much as possible. Since the new project Mining Industries has a strong technology component – some of the process is portable. I can work on the cropping and conversion of LiDar scan data anywhere, but when it comes to mold making and casting glass – I need to be in my studio where I can make a mess and have access to kilns. For more than ten years, I explored the relationship between generating 3D printed patterns, mold making, and casting a variety of materials. Mining Industries represents the synthesis of many early experiments. Within my work, it’s the representation and form of the subject matter that changed. One of the early influences connected to finding a way to make sense of the dramatic population decline in the city of Detroit as well as developing new ways to visualize the change over time. It’s this early question that continues to be the foundation for my approach to other cities. While growing up, I had several family members connected to the automobile industry in Detroit. Attempting to make sense of the family conversations and connecting the question of how my local industry (automobile production) related to a much larger national discussion aided in the growth and development of studio practice. During graduate school at the Cranbrook Academy of Art, I had the opportunity to take electives in Architecture and Industrial Design giving me several ways to look at my sculpture work in new ways. It was at Cranbrook that I had my first introduction to the potential of 3D printing and CAD software. If I were to move away from sculpture or compliment my career in visual art, I would likely find myself working in a field related to Architecture or Industrial Design. Norwood Viviano is an Associate Professor at Grand Valley State University, where he is the Sculpture Program Coordinator. 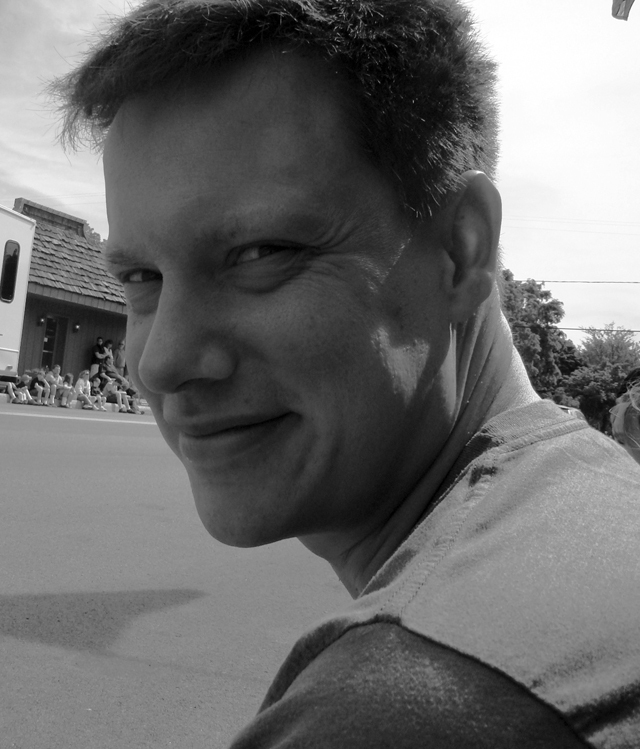 He received a BFA in Sculpture and Glass from Alfred University and MFA in Sculpture from the Cranbrook Academy of Art. 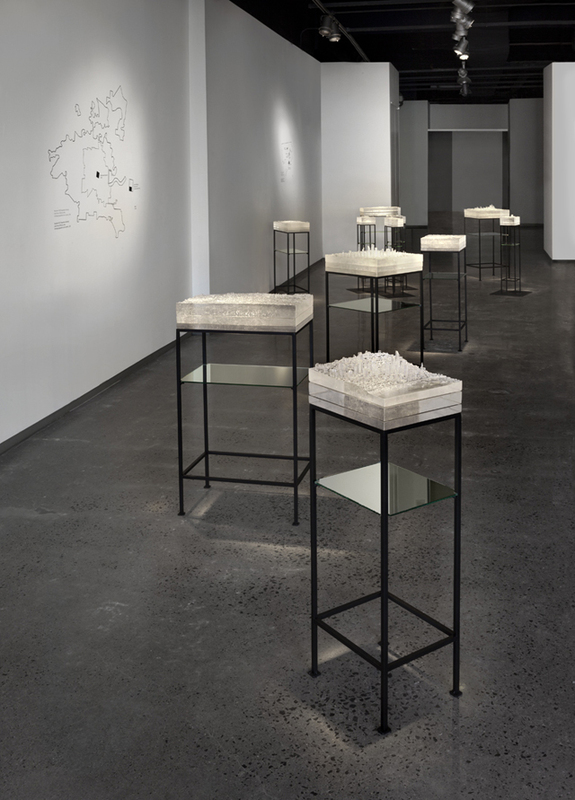 Viviano utilizes digital 3D modeling and printing technology in combination with glass blowing and casting processes to create his sculptural works. In 2001, he was the recipient of the Emerging Artist Award from the Glass Arts Society. Recently he was an Artist-in-Residence at the Royal College of Art, London, UK, Ox-Bow School of the Art, Saugatuck, MI, the Museum of Glass, Tacoma, WA, the Corning Museum of Glass, Corning, NY, and was awarded an Arts/Industry Residency at the Kohler Company in Kohler, WI. Viviano’s recent exhibitions include, Grand Rapids Art Museum, Grand Rapids, MI, Art Miami/Context Art Miami, Miami, FL, Heller Gallery, New York, NY, and the Venice Biennale, Venice, Italy. This entry was posted in Uncategorized and tagged Digital Sculpture, Heller Gallery, kilncast glass, landscape, LiDar. Bookmark the permalink.